Sign-up and watch any of our free videos. We are apologizing, but the request was not received due to a temporary error. 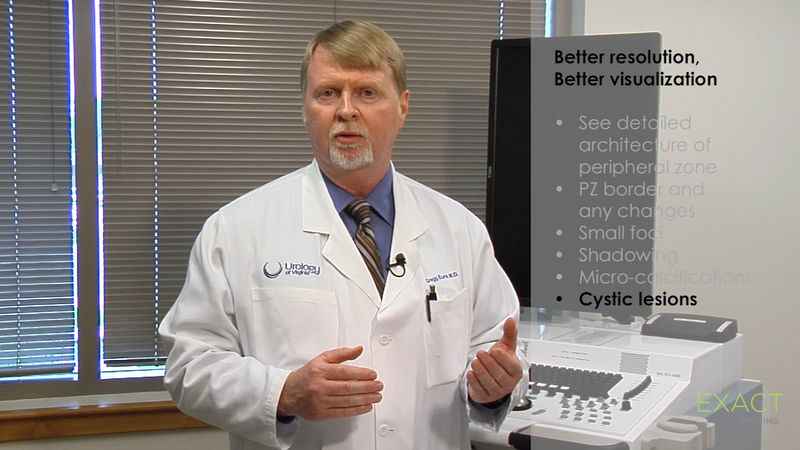 Watch this 3 minute video describing the benefits of micro-ultrasound. With the ultra-high resolution of the ExactVu™ micro-ultrasound system, Dr. Gregg Eure describes some of the detailed anatomy and prostate tissue characteristics that he is now able to visualize. These include diffuse tissue patterning, shadowing, micro-calcifications, cysts and ducts, detailed visualization of the prostate borders and clear visualization of the architecture of the peripheral zone. ExactVu™ micro-ultrasound system is available for sale in the European Union (CE Mark), the United States (FDA 510(k) clearance), and in Canada (Health Canada license). Please visit the rest of our site. I’d Like to request an ExactVu Demo.